We are proud to have these Custom Eli Miller Saddles available to our clients. We have had each saddle made to our specifications, to best fit our customers needs. Eli Miller is a Legend in the saddlemaking business He has sold saddles all over the world. These are not assembly line "Miller" remakes. They are the real deal. Eli Miller makes each saddle by hand, one at a time by custom order. He uses the best leather, made in the USA by Wickett and Craig. The trees are made by Batie Custom Trees. They feature more flare in the shoulders than most saddles trees. This improves the fit and performance for the equine athlete and pleasure mount. You will not find better made saddles with this quality and workmanship anywhere, especially at the price. The saddles here are in stock, but we can get one custom ordered for your specifics, if you wish. *** We also always have a selection of used Western and English Saddles. Used Saddles, click here. Custom Made Vaquero Saddle handcrafted by Eli Miller. 16" seat, Batie tree, featuring flared bars for free shoulder movement. Slick seat with high cantle. Rolled stirrup leathers for comfort when riding. Functional Sam Stagg rigging and 3" rear cinch completes the cowboy looks and style. Custom tooling. Square skirts. This is a standout saddle. You are not going to find another one just like it. One of a kind custom saddle. Genuine Eli Miller Custom Made Buena Vista Plantation Saddle. English flap and leathers. Added pencil roll, beautiful hand tooling. If you are looking for the ultimate comfort while you ride those long trails, you need to check this saddle out. The unique feature of this saddle is the Suspended Seat system. This is what makes the Eli Miller Buena Saddle so darn comfortable. The padded seat is very roomy and has a lot of clearance up in front and it cups your thighs in the rear. Many trail riders won't ride in anything else, they keep them forever and have high praise. They are particularly popular with gaited horse owners as they offer comfort for the rider and room for the horse to move out. We offer custom built Old Timer Saddles. They are made on an A fork tree crafted by Batie Trees. The Batie trees offer more room in the shoulder which allows for much better performance in the using horse. The Old Timer Saddle can be made with a regular or suspended seat. You have your chose of colors, tooling, conchos and rigging. We use one of the Old Timers daily, such a great using saddle. It fits most of our horses and is comfortable to ride. Click here to see some photos of available options. The trail saddle is lightweight but still of the highest quality. Built on the custom Batie tree with a padded seat. It has a good pocket to hold you in and free swinging stirrup leathers for more leg mobility. The flared bars allow it to fit a wide range of horse including gaited breeds that need more room to work with ease. This saddle features double row barbed wire tooling, wide padded stirrups and soft, supple leather. Other options are available. This saddle is super lightweight and ultra comfortable. It features a suspended seat which is like riding on air. The Batie tree has 7 degree more flare to the bars, allowing your horse to move and collect easier. The stirrup bars are ground smooth which enables your leg to move freely, much less restriction than many western saddles. Stirrup turners ease the pressure on your knees on those long, hard rides. You can add many custom options such as bucking rolls, quilted seat, choice of conchos and tooling and much more. 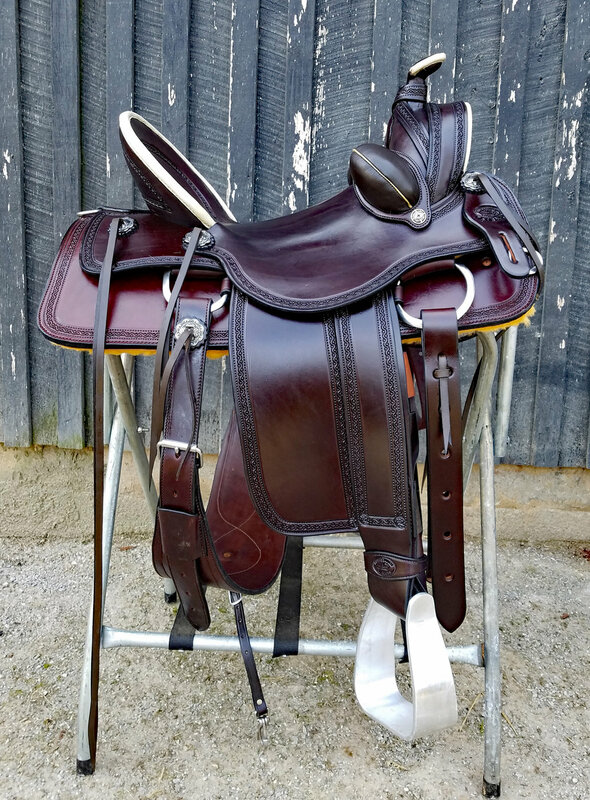 Genuine Eli Miller Custom Made Buena Vista Plantation Saddle. If you are looking for the ultimate comfort while you ride those long trails, you need to check this saddle out. The unique feature of this saddle is the Suspended Seat system. This is what makes the Eli Miller Buena Saddle so darn comfortable. The padded seat is very roomy and has a lot of clearance up in front and it cups your thighs in the rear. Many trail riders won't ride in anything else, they keep them forever and have high praise. They are particularly popular with gaited horse owners as they offer comfort for the rider and room for the horse to move out.